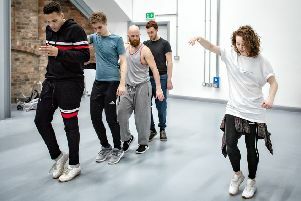 We’ve all experienced bouncers in one way or another, whether we studied John Godber’s play Bouncers at school or have come across the real thing at a night club, writes Emma Vincent. Which is why this classic tale of a Yorkshire night out relates to all of us on so many levels. And it is why the playwright’s 1987 masterpiece continues to stand the test of time. 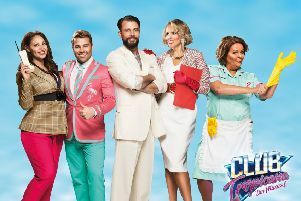 Now updated and rebooted for the 21st century and about to start a run at Theatre Royal Wakefield followed by a national tour, I caught up with the four actors - Frazer Hammill, Duncan Riches, Peter McMillan and Lamin Touray - who take on the roles of Lucky Eric, Les, Judd and Ralph. Rehearsals began on January 7 ahead of its start in Wakefield on January 24 (it runs to February 2) with a meet and greet and read-through. “It’s great! Feels like we’ve been rehearsing for ages, not in a bad way. We’ve got through so much,” Frazer tells me. “Well in terms of prep, it’s always nice to get the script nice and early,” says Duncan. Peter says: “I’ve just drawn from nights out really. I remember when I first started going out and there was this one bouncer who would just not let me in every week to this club. “It was really random, like over 19s only. “He used to just give me a glassy stare and say - ‘Not tonight lads’. For some of the cast, this wasn’t their first involvement with the play. Lamin tells me he’s seen the play performed before a couple of times. Godber’s last production of Bouncers in 2015 featured Frazer in a different role. He explained how the story has changed since then. “Last time was a completely different version. “In certain scenes last time there seemed to be an established way of doing those scenes, whereas this time, it’s so different because it’s a fresh cast and it’s been really nice to explore. Any trouble with bouncers in the past? I had to ask! “I normally stay out of trouble,” confesses Lamin. “One time a bouncer said there was no chance me and my mates would get in, but I made it my personal mission to change his mind and persuade him. “I was trying to get into a club,” says Duncan. “It started off fairly normal, one bouncer checked my ID and waved me in, then I got another bouncer with a metal detector. “Never happened before in my life! He ran this metal detector all along my arms, up and down my legs, up my back… I thought, what on earth is going on?! “Are you sure you weren’t at an airport?’ Peter laughs. Now it’s back to rehearsals for these four until opening night. Bouncers opens at Theatre Royal Wakefield on Thursday, January 24 and runs till Saturday, February 2 before heading out on its UK tour. You can book tickets now by calling the Theatre Royal Wakefield Box Office on 01924 211 311 or alternatively visit theatreroyalwakefiel.co.uk. And remember, if you haven’t got a ticket, you’re not coming in!